Mario Kart 8 recently got its first DLC, a free download which includes Mercedes Benz cars. It seems slightly out of place to me… leaving aside that it’s a kart racing game without an ounce of realism, I feel like Nintendo’s demographics don’t include a lot of people in the market for luxury cars. Fashion on the other hand… there’s some real opportunities there. 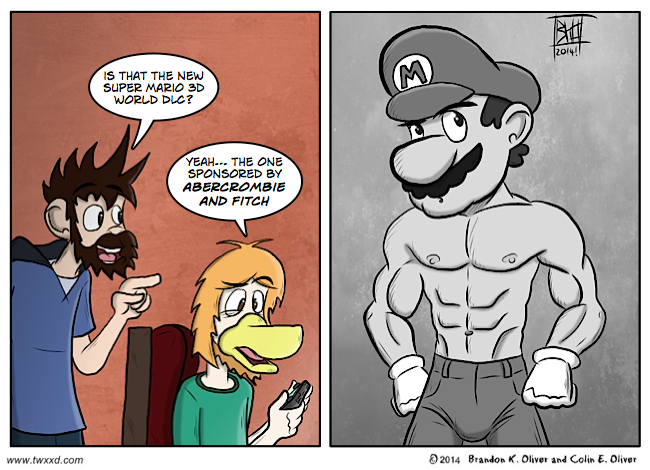 If it was Ambercrombie & Fitch then Mario would have had to shave for that picture. And I don’t mean his chest! I always laugh at those posters in the entrance to that “Clothing Store”. There would be a market for this. Also, Colin’s hair get longer? Any idea what Mario’s ab routine is? I’ve not been able to achieve results like that yet but I am working on it.